Carolina Herrera CH Men is designed for free & independent & self-confident men. Carolina Herrera CH Men Eau De Toilette 100ml. is a luxury men's fragrance, which is designed eccentrically elegant men who like to suggest their superiority. This perfume CH Men combines woody, spicy scent that perfectly highlight the manly courage of perfect dandy who never wants to be out of action. The unique combination of the essence of fragrance Carolina Herrera CH Men will inspire and also will complete your style perfectly. This perfume by Carolina Herrera is the perfect complement during a busy day and evening meetings. Thanks to its extraordinary composition it perfectly stays in every season and in every situation. 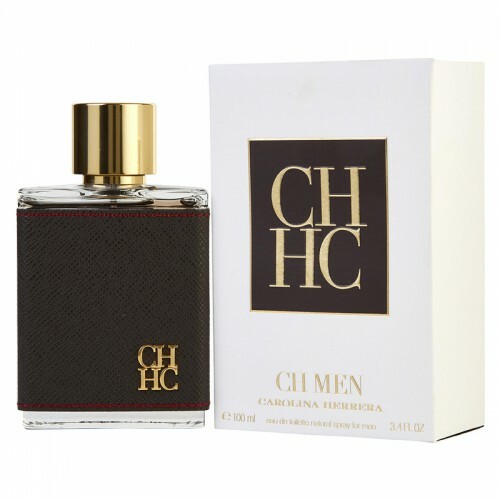 Fragrance Carolina Herrera CH Men is an elegant and eccentric at the same time! The perfume perfectly combines opposites and thus leaves behind a lasting impression. Stylish fragrance Carolina Herrera CH Men is designed for today's active men, not waiting for gifts from fate and self-building their lives. Rich sound that emits the smell freedom and independence, which can be attained only by taking on full responsibility for every event of their lives. Proposed perfume remind breathtaking journeys, a bright holiday with friends and unforgettable victories. Carolina You Herrera has of CH Men is a wonderful east-spicy composition, in which the sound is heard the noise of the turbulent mountain rivers and rustling of exotic plants. In its unique mist was a place for active notes of grapefruit, and charming accents of bergamot, and mysterious chords saffron. Delicate notes of jasmine and violet in this perfume are complemented with noble wood chords, making it sound both sensible and restrained. Velvet oak moss interwoven in the perfume with the sweetness of sugar, skin roughness supplemented soft cloud of vanilla and amber. Date fragrance: oriental spicy Top notes: bergamot, grapefruit Note the "heart": saffron, woody notes, jasmine, violet Final note: green oak moss, amber, vanilla, leather, sugar.